Former President John Dramani Mahama has been pictured at the Criminal Investigations Department (CID) headquarters over the detainment of the Deputy General Secretary of the opposition National Democratic Congress (NDC), Koku Anyidoho. 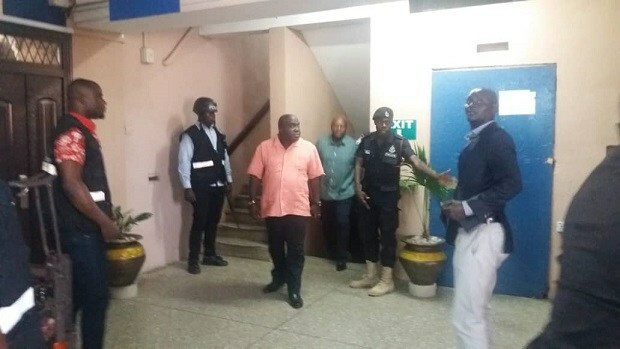 Mr. Mahama who returned from Sierra Leone where he acted as an Election observer, moved to the police CID in an attempt to intervene for the release of Mr Anyidoho who had already spent more than 24 hours in the custody of the Bureau of National Investigations was seen with Julius Debrah, who served as his Chief of Staff, at the CID headquarters. 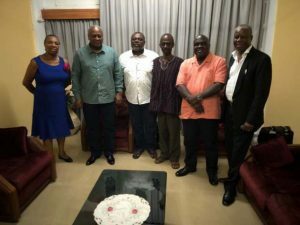 The NDC guru is facing charges of treason for threatening the government with a “civilian revolt” that will lead to the overthrow of the Akufo-Addo government.